This is a call to all SUSPIRIA fans - participate in CultFilms' campaign and help us release a limited edition of SUSPIRIA. 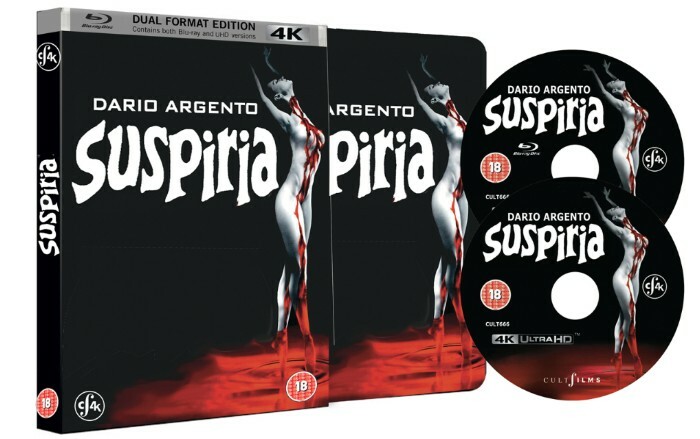 Here's your chance to get your hands on your very own UHD and Blu-ray numbered dual edition SteelBook of Dario Argento’s horror masterpiece! As a Shameless customer, we want you to be the first to know when CultFilms' SUSPIRIA crowd-funding campaign goes live on the 30 October! This will give you a chance to take advantage of our limited early bird perk, at a reduced price. We want to bring the full astonishing cinematic experience to your own home by creating a dual edition containing an Ultra High Definition (UHD) disc and a standard Blu-ray disc. And we want to offer you the possibility of owning this very special dual edition in a beautifully designed and embossed SteelBook. This will be a numbered limited edition and one of the very first times the UHD format will be used for a non-mainstream film. But releasing the 4K SUSPIRIA restoration in this package isn’t cheap, and that’s why we need your support! We'll be sending out the early bird link to you soon." Sounds interesting, lets hope distributors aren't going to be going all 4KUHD on everything & throwing the inferior blu ray in as an afterthought! As a side note, can you play UHD blu rays on a regular player or do you literally need to buy a new player. I remember getting a blu ray player in the first place because so many things were "only" coming out on blu ray (especially the extras). Not another format jump so soon! A nice 4K transfer on a regular blu ray ala Arrow's Thing set would be a better choice for Suspiria fans I think! And money spent on extras instead of a new format I'm sure would be preferred. Modern Blu-ray players can upscale almost anything to 4K UHD - from potato quality internet clips to 1080p Blu-ray, as long as you own a 4K UHD TV. 4K UHD Blu-rays need their own players, though. It's a new format, and the new devices aren't exactly cheap at the moment. This doesn't need crowdfunding. It's up for sale already. Slip case and all. Your link leads to a version that mentions a "Special Dual Edition" with "DVD and Bluray". Suzi's original post is about a "dual edition UHD and Blu-ray". Not to me, though. I still enjoy most of my films on DVD. Demdike@Cult Labs and SilverSurfer like this. The crowdfunding is just to get the 4K UHD disc, the regular release will be widely available for the 4K disc is exclusive to the Indiegogo campaign. Demdike@Cult Labs and Prince_Vajda like this. So that's Nos and Treb on here then... and Treb's already sold his to CEX. And I'm probably not buying any because I got the recent Italian release. It also really winds me up that Cult Films do the title on the spine the wrong way around. You know this is a duplicate of your previous post, don't you?